Last Friday we took part in the Barnardo's Big Toddle 2014. A sponsored toddle had been organised by local magazine, Time for Tots at Wicksteed Park. Prior to the event I created an online sponsorship form. I took along four children. Between them and their parents they raised £165 for the charity. 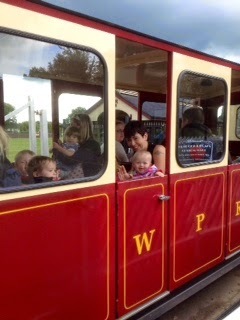 Anyone who raised £10 or more received tickets for a free ride on the park train. We had a lovely day, it was just a shame that the awful weather cut it short. I promised the children that I will take them back to Wicksteed soon.